If you read that headline, you may be confused. What exactly is Amazon Storyteller? 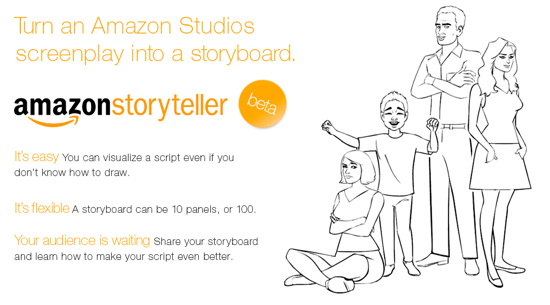 Well, it’s a new service from Amazon Studios that allows writers to turn their scripts into storyboards, complete with characters and dialog. This new storyboard can then be shared with others for feedback. The new service launched today, but is currently in beta. The best part, it’s free. Storyteller begins by scanning a movie script that has been uploaded to Amazon Studios. It identifies the scenes, locations and characters from scene descriptions, and “casts” them from a library of thousands of characters, props and backgrounds. Filmmakers can recast or change locations, or they can upload their own images. For many of us gamers, MMORPGs can seem like a huge commitment. They can be time consuming and expensive, and other than World of Warcraft, none of them really seem to retain players for a long period of time. That’s why many MMOs are choosing to move to a different model of pricing. League of Legends has proved that free to play MMOs with in-game transactions- extra weapons or characters or outfits that players can purchase with real world cash- not only maintain players, but maintain profits. Firefall is another one of those free-to-play MMOs, and I got a chance to check it out on the show floor at PAX East. During my time playing Firefall, I got a chance to create a character and complete a few quests. I chose a female Assault character. You won’t have to play cooperatively in Firefall, as I was doing quests on my own, and you won’t have to participate in PvP either. I found the questing system really unique- I was sent on a quest to investigate a water shortage, which turned into me killing the monsters in the area who were causing the problem. A lot of other MMOs would have just sent me after the monsters in the first place, but Firefall gave me a chance to investigate and figure things out on my own. It was a nice touch that I can foresee making the level grinding in the beginning of the game a little less repetitive and more enjoyable. I have to admit, my favorite part of the gameplay and controls of Firefall was my jetpack, which the entire environment seemed to be built around. The environments of Firefall are really open and well designed. I loved the cell shaded graphics in the game- it made it feel even more removed and unique from other MMOs out there. If you played the game at PAX East you’ll be able to access the closed beta of Firefall, and the full game will be released later this year. Much like death and taxes, another inevitable fact of life is change. When it comes to products and services, often change is for the better and helps a product or service improve and attract new customers while solving some of the complaints of existing ones. The new interface focuses largely on customization and Google’s Hangout video chatting service which gets new features to make it easier to discover conversations and new profile pages. There’s also a new navigation bar perched to the left of the screen. This so-called “ribbon of applications” can be dragged, dropped and placed in any order. The new interface also features a Facebook-like chat bar on the right with a “Trending” widget to help users discover popular topics. There’s also a dedicated Hangout page which will help users by giving them quick access to popular hangouts, tips and live broadcast. For more on the new design, click through to check out Google’s official video on the subject. Game Stop has always been an interesting force in the world of video game retailers. They are fabulous in the sense that they are major players in the used game market, really refining a trade-in infrastructure that allows people to get their hands on new games cheaper. On the flip side of that coin is the seedy fact that they pay dirt cheap prices for games (I once got a quarter for a three year old Madden title!) and mark them up significantly. It is hard to truly be angry about this though, as they follow a pretty strait forward supply and demand model in their pricing. Of course as Game Stop grew, so did the concept and popularity of used sales. Used sales is great for the gamer, but horrible for the game developers, as they don’t see a dime off of the used sale. In an effort to mitigate these losses, developers and publishers have begun supplying online pass codes into new games, effectively forcing those who buy used copies to shell out $15 bucks for the same content that would be free if purchased new. There has been a wonderful recent trend of classic game franchises that were dormant being given new life with current generation updates. The most recent franchise to get a respectful update is the PC classic MechWarrior. MechWarrior was a high water mark in PC gaming in the ’90s, offering incredible game play and even better graphics. Back in it’s heyday, no consoles could compete with the graphical power of the top tier PC games, and as such MechWarrior was very much a gamer household name. Obviously things have changed, and the once proud franchise has almost all been forgotten. That is until the brand new MechWarrior Online releases later this year. The game boasts inedible graphics and real time giant robot physics (if there can be such a thing), meaning over-heating, terrain, weather, and gravity are all going to be factors you must contend with. At the recently concluded Game Developers Conference, the first game play footage of the new game was revealed. It looks like a nostalgia sandwich wrapped in a shiny, next-gen wrapping. Just watching the game play footage harkins back to a bygone time in PC gaming. First-Person robot destruction still looks like a blast. Check out the new footage after the jump. When DC Universe Online debuted last January, it became the first MMO available for the PlayStation 3. Sony Online Entertainment wants to celebrate the first anniversary of this hit game by providing a special mission and item in game today. To celebrate the game’s one-year anniversary, players will receive a special one-of-a-kind One Year Anniversary Cape that features a number “1” on the back. The cape will be granted to players through their mission journal on January 11. The character must exist on the 11th to be eligible to receive the mission. However, players do not need to log in on the 11th; as long as the character exists on the 11th, players will receive the mission the next time they log in. The game went free to play late last year and has been a hit among MMO fans and comic book fans a like. More on what the game has accomplished in it’s first year after the jump. If you’re one of the people who was enjoying your $9.99 instant streaming plus one DVD deal at Netflix, get ready to be disappointed. That’s right, that nice low price for the service you love is going away, effective today. Can’t say we didn’t warn you this day was coming. Instead, you can now pay $15.98 (60% more) for the same service. Of course, you can opt for the streaming only plan like most of us here at The Flickcast do. That’s still only $7.99, which is a pretty good deal. Sadly, the selection of movies that are available for streaming is still not all that great and if you’re looking for relatively new movies, you can forget it. Most of them don’t ever make it to Netflix streaming. However, there are some and there is also a pretty decent selection of older and classic movies. Plus, the selection of TV programs is pretty good, even including some cable and non-US shows in some cases caught up with their current seasons. So, it’s not a total loss and worth it for the money. Still, for those of you who enjoyed that low priced plan for streaming and for a DVD now and then, today just isn’t your day. Now that this new pricing is in place, will this cause you to leave Netflix, change to a different plan or just pay the higher price? Sound off in the comments. What was the world like without YouTube? Hard to believe that was an actual thing at one time, but it’s true. There were things like TV, radio, and even books to keep people entertained long before watching 30 second videos in which a baby farts and sneezes at the same time was a national pastime. With those early dinosaur years in mind, YouTube has decided to show us what it would be like if this free video service was available in the time of silent movies with YouTube 1911. The site has been res-kinned for the day, and a new feature has been added to all videos, in which you can see what that video would look like in old-timey coloring and, of course, without its original audio. One of the best things to come out of this prank is their video in which 5 top YouTube classics get recreated for 100 years ago. Take a look at the video after the jump. If you needed a more clear example of TV-based original superhero shows, there is none more showing than this. NBC has decided to pull their two-part Cape finale from TV and only air the episodes online. The disappointing performance of both The Cape (which early last month saw its 13-episode order cut to 10) and The Event has caused much shuffling of NBC’s midseason schedule. At first, The Event‘s return from a winter hiatus was pushed back a week so that The Cape could wrap its run on February 28 with a pair of episodes. Instead, NBC made way for Chuck (no argument there! ), leaving The Cape‘s finale unaired. We’ve been following the development of DC Univserse Online for some time and at points, it looked like it may never see the light of day. Fortunately, those fears proved unfounded as Sony has announced it will debut the new MMOG worldwide on January 11, 2011. The game has reached gold status and is ready for primetime. It will be available on the Sony PS3 and PC at launch. In truth, we’ve been playing it for a little while now and so far it’s pretty darn cool. Expect a full review soon. In the meantime, get ready for some great gameplay in January. Check out the full release from Sony and DC after the break.